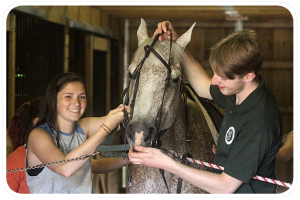 Why Quinebarge Over Other Summer Camps with Horseback Riding? 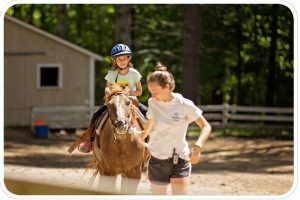 The majority of summer camps with horseback riding fall into one of two categories: horseback riding camps, which focus solely on that activity; or camps that offer horseback riding for a fee. Here at Camp Quinebarge, horseback riding is one of the many fun and exciting activities we offer, and is included in camper tuition. Campers at Quinebarge get the all-around traditional camp experience, without the financial burden of extra fees. We hire knowledgeable, skilled staff to manage our stable and run our English and Western riding lessons. Campers range from total beginners to intermediate equestrians, and ride every day. Once campers are comfortable riding unassisted, counselors lead trail rides through our 70 acres of camp and pine forest trails. When they are not on horseback, campers learn how to take care of horses, including feeding and watering, mucking stalls, brushing, tacking up, and basics of horse health. We do not require campers to bring breeches or riding boots, though they may bring them. Campers must wear long pants or leggings while on horseback. 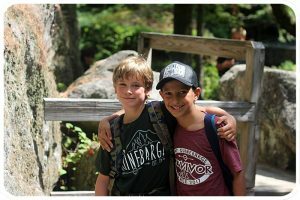 Our values and goals boil down to two things at Camp Quinebarge: fun and friendship. We firmly believe that allowing campers to choose their own activities fosters both of these by allowing campers to do what they love, with those who share their interests. Campers interact, play, and learn with their peers of all ages, rather than only their cabinmates. Every summer, our campers go home with warm, happy memories and friendships that will last a lifetime.